Introduction: Due to scientific and technological development, Medical Education has been readjusting its focus and strategies. Medical curriculum has been adopting a vertical integration model, in which basic and clinical sciences coexist during medical instruction. This context favours the introduction of new complementary technology-based pedagogical approaches. Thus, even traditional core sciences of medical curriculum, like Anatomy, are refocusing their teaching/learning paradigm. 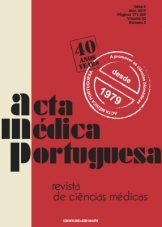 Material and Methods: We performed a bibliographic review aiming to reflect on Medical Education’s current pedagogical trend, by analysing the advantages of the introduction and diversification of pedagogical approaches in Anatomy Education. Results: Anatomy Education’s status quo is characterized by: less available teaching time, increasing demands from radiology and endoscopy imaging and other invasive and non-invasive medical techniques, increasing number of medical students and other logistical restrains exposed by the current Medical Education scenario. The traditional learning approach, mainly based on cadaveric dissection, is drifting to complementary newer technologies - such as 3D models or 2D/3D digital imaging - to examine the anatomy of the human body. Also, knowledge transfer is taking different channels, as learning management systems, social networks and computer-assisted learning and assessment are assuming relevant roles. Discussion: The future holds promising approaches for education models. The development of Artificial Intelligence, Virtual Reality and Learning Analytics could provide analytic tools towards a real-time and personalized learning process. Conclusion: A reflection on Anatomy Education, as a comprehensive model, allows us to understand Medical Education’s complexity. Therefore, the present Medical Education context favours a blended learning approach, in which multi-modality pedagogical strategies may become the landmark.